I currently live in Seoul, South Korea. A city that never sleeps. Much like my daughter Luna when it comes to sleeping in a bed. With this as the starting point of my story, I realize mine must be similar to many! The reality of this situation is that babies know what’s good. They like to sleep on or near their caregiver and I resigned myself to that even before she was born. I always knew I would wear her. To what extent, I had no idea. From birth she had no interest in reclining or being horizontal alone in all those things we are sold as new parents: Bouncy chairs, not having it. The highly recommended, must buy, automatic rocking cot, nope. A co-sleeper, never. She liked one thing: For her back to be vertical and be high up, able to see the world. Her choice, not mine. After she was about a month old I also discovered that she would sleep longer if I wore her and walked outside. I would take advantage of her extended afternoon naps to get out and visit Korean markets, department stores, and galleries. The market stall ladies would peek their head in and gasp in shock that I was taking such a young baby around with me. Despite Korea being a babywearing culture with traditional podaegis and trendy hip seats, it’s also tradition to stay home the first 100 days of a baby’s life to both keep it safe from illness and for the mother to recover from birth by eating iron-rich seaweed soup everyday. Let’s just say those early days we garnered a lot of attention that might have been a little negative as we set about our city adventures. But I do highly recommend the seaweed soup! Getting around Seoul is very easy but not terribly so if you are pushing wheels. I found babywearing gave me the freedom of mobility and a sense of security in the hustle and bustle. I could take the bus or metro with ease, maneuver the small back alleys, and enter the many shops that included steep steps. With so many people around, and sometimes overly friendly stray hands, I also had full awareness and the ability to protect my baby. We were one. Besides mobility, it gave my daughter a view to take in the world. I could see curiosity in those little eyes from the beginning and I’m sure Seoul was a dazzle of lights to her with all it’s neon and shiny things stacked on top of each other in the streets and markets. As she got older her curiosity only grew, even to hyperactivity. Wearing made it possible for me to calm her flurry of flaying arms and shifting gaze. Another thing I found wonderful about wearing Luna was it allowed her to be included in every conversation. After the 100 days, I started wearing Luna to fashion events and even to Seoul Fashion Week where she was immediately acknowledged and greeted by others. Koreans love babies and despite it being a little weird to see a baby at a fashion event, people engaged her in cute conversation, wave or shook her hand, and wanted to take her photo. Calm and content in the commotion, her face would light up with the recognition and she enjoyed the attention. What I loved about this is that the greeting in Korea is very important. Parents teach their children to bow to elders from a very young age and the quality of your greeting skills will always mark you as a person. Not only did she learn to greet others, she has been fully included in the conversation. This perspective is more equal on so many levels. Her world included fashion shows, people’s faces, hand gestures, hugs, pretty interiors, lovely catering… whatever I could possibly be enjoying at an event, she did too. Her world was not simply people’s knees and ankles as if she were sat in a stroller. Or even just of our home if I attended events without her. So that’s my babywearing story. As you can see everything about babywearing is for the benefit of my baby… Oh wait I almost forgot! I love fashion. I’ve been working in fashion in Korea as a lecturer, consultant, stylist, influencer, and sometime TV host so I just love fashion and it has become so much of who I am. Babywearing allowed me to achieve two things: Be the mother I felt I needed to be, fulfilling this deep instinct to care for my daughter in a particular way that many think of as being inconvenienced. I certainly fall into the label of Attachment Parent or “crunchy mom” as the American slang goes as I not only babywear but co-sleep, cloth diaper, breastfeed and so on. 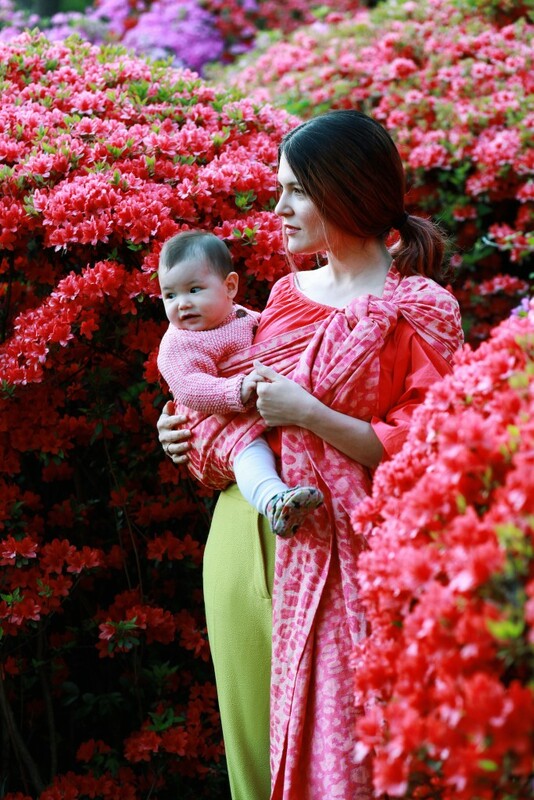 Babywearing also allowed me to feel more myself, or maybe, my best self. There is no compromise. 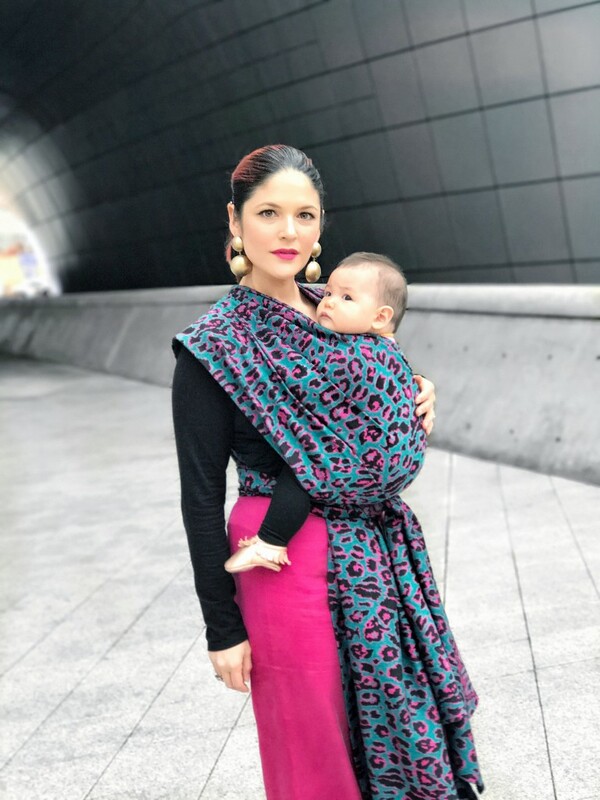 Babywearing with wraps, and particularly Artipoppe wraps, allowed me to continue to find joy in dressing and feel beautiful and chic. Fashion and motherhood can be one. I find it so odd that many seem to see pregnancy and motherhood a time to become dowdy and matronly. I loved dressing my pregnant body and I got many raised eyebrows here in Korea for my bright bodycon dresses and kimono combinations. Indeed, it’s not easy and we have very little time as mothers but there are shortcuts and hacks to style! Simply styling a stunning wrap with a classic nursing t-shirt and wide trousers or jeans and sneakers is an easy mom outfit but actually very cool, fun, and fashionable. I’m a great lover of millinery hats and scarves, so wraps are equally as fun and simple to style. My collection of Artipoppe wraps is growing and I strategically buy them based on how I think they could be styled with clothes. The outfit can be a blank canvas, the wrap a splash of artistic paint, the exclamation mark in the sentence. Wraps are the little bit of luxury you feel you can indulge in when everything else is covered with food and your hair has not been washed. Luckily, I always rocked the mom ponytail before baby came so no one really noticed a difference in the hair department! In conclusion, overall I guess I feel like people have low expectations for babies. Like babies don’t quite take in as much of the world as adults do. I want to share my life with my children not by accident. I never had the desire to leave my baby at home with a babysitter. Even I’m sure she would be bored by that as when we leave the house, Luna kicks her legs in excitement to see something different. For me the point is experience. Experience in all facets of life is the best education. It makes us better thinkers and practitioners. Babies develop so quickly that one minute they are laying on their back and then next flipping over and crawling, that it makes me think if they missed viewing the world or experience in the first year what more could have developed in their mind? So yes: Experience and engagement. Inclusiveness. The ultimate assurance and feeling of safety. That’s some pretty awesome things to be able to offer another human. Babywearing has allowed me to calm my baby and get her overactive personality to sleep. It has allowed me to read her better, to attend to every need so that she knows she can trust me. It has allowed her and my husband to be totally bonded as he will wear her for every nap and other chance he can get. It has allowed her to join me everywhere I go in total ease. It has allowed her to be dazzled by city lights & sounds and perhaps develop her own style and taste. It has encouraged her to be social and adopt the social manner of her surroundings. It has allowed me to continue to have fun with fashion and share that joy with my daughter. In everything I do, I want it to be a fun adventure so being a mother has been no different thanks to babywearing. Most of all, it has allowed us to share a very amazing connection and I’m certain she know she is loved. Who would have thought a long piece of cloth, albeit a very beautiful, luxurious, and well designed one, could be so many things?